I recently joined GDS as the Community Manager for User Centred Design. The user centred design community includes the cross-government design, content, accessibility and user research communities. My role is to help grow user centred design across government; help designers, content designers, and user researchers work better together; and help them share best practice. 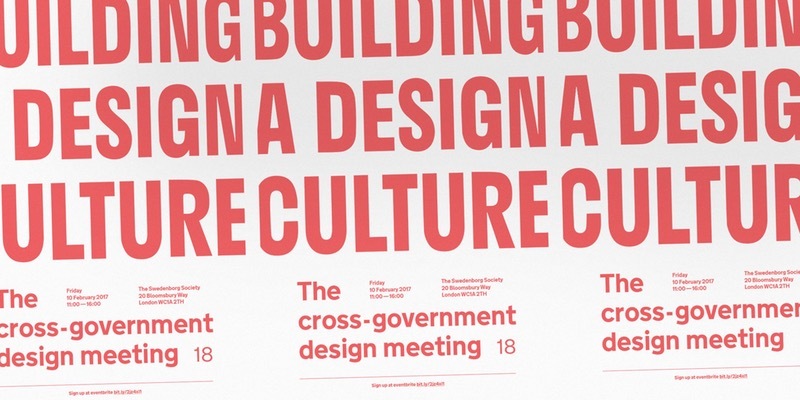 I was very happy to find out that the first cross-government design meeting I would attend was about building a design culture. That’s what a user centred design community is about right? The cross-government design meetings happen every 8 weeks. They’re an opportunity for the design community to come together to find out what other departments are working on, share stories, and meet each other face to face. For the most recent event, which was held in February, more than 100 designers met up in London. Over the day we had talks from designers in government, a workshop on design culture, and talks from external speakers to provide some inspiration and an outside government, commercial perspective. The cross-government design meeting is one of the many rituals that bring government designers together to meet each other and share what they’re working on. By rituals, I mean the things we do over and over again. During the workshop, the group identified practices that are working well to build design culture in their teams and departments. Things like show and tells, retrospectives, meetups and even team lunches and outings. Other practices include shared language and collective actions such as make your work visual and visible. Charles Reynolds-Talbot, Senior Interaction Designer at the Home Office, gave a 3-minute lightning talk called ‘Semantics mean something’. He spoke about about how the language we use has an impact on the design culture we build. Semantics are important. For example, in government we design for user needs, not customer needs – our users don’t have a choice but to use our services. Similarly, when we describe the context of government work, government operates as an organisation or department, not a business. Ben Holliday, Head of Design at DWP Digital, talked about how we can use small, collective actions to build design culture. Such as making sure everyone can talk to each other, giving everyone the opportunity to meet face-to-face and encouraging everyone to work in the open. Ben reminded us we all play a part in building design culture and that we should lead by example and keep design fun. Design leadership is important for building a strong design culture and design leadership starts with all of us. Jonny Burch, Head of Design at Deliveroo, spoke about how we can lead by example. He talked about how the role of designers is often to make others look good and to own the problem. The workshop provided time for the group to talk about the things that are hindering our ability to a build design culture—space was a recurring theme. The right office environment is crucial to building a design culture. Designers like to think in the open, and openness needs space. We make our work visual and put stuff on walls to share with team members and other people in our organisation. The lack of wall space or even the lack of permission to put stuff on walls hinders our ability to share things. Another barrier the group talked about is where organisations are risk-averse and designers don’t have room to use an agile approach, experiment and potentially make mistakes. Some people felt that deadlines can be a constraint to this agile approach. Some suggestions that could help were to show the process more and for everyone in the organisation to have a better shared understanding of project phases: discovery, alpha, beta, and live. The group talked about how important it was to build a design culture that could span departments and could connect with people doing similar work to designers, such as data and analytics teams. Some design teams felt that they needed support to more effectively make their own case. Another issue was confidentiality – if we cannot talk about the projects we are working on then it is difficult to work together and learn from each other. Some ideas to collaborate better were to share examples of success with non-designers, more show and tells, cross-functional teams and getting the right people at the right time together face-to-face. In the UCD community we use many tools to share, learn, ask questions, and build on each other’s work. In the workshop on design culture, the group emphasised the value of shared tools like the cross-government Slack, cross-government mailing lists, Github, the Hackpad to share design patterns, the Design Principles, the Digital Service Standard and the Service Manual. The community contributes to all of these tools, however the group talked about how some tools like Slack are not available for everyone to use. Even though we may not all be able to access the same tools, there is still more we can do to work together and learn from each other. The group concluded we can have cross-disciplinary meetups, blog about our work, and share and support each other more across departments. Similarly, a community is always changing, with new people joining, new problems to address, new things to learn and new tools to use. If you have any ideas or want to chat about the user centred design community then please email me kara.kane@digital.cabinet-office.gov.uk. I’d love to hear from you. The next meeting is on 7 April in Cardiff. The cross-government design meetings are open to people working in user centred design in government (both contractors and civil servants). If you would like to attend, please sign up on Eventbrite. To find out about future events and get connected to the community join the Digital Service Designers mailing list. Follow Kara on Twitter and don't forget to sign up for email alerts. Hi Adam, we talked how working together across disciplines can break down silos and help build a culture of design in organisations. Some things the group mentioned were pairing with different disciplines, getting stakeholders involved in research, bringing local design communities together for face to face meetups and designers working with people from policy.